Dash Darhk is everything her parents would hate. He's six feet and two inches of dark temptation and a killer smile, that's surely left a stream of broken hearts in his wake. But her parents are nowhere to be found. Charlotte is alone in this new world. Destroyed by a toxic mist, the land isn't the only thing altered, but the inhabitants as well. As Charlotte begins the hunt for her family, gifts she's never fathom awake inside her. And with the gifts come problems. Enormous ones. Charlotte is running out of options and places to hide. If she can't figure out who to trust - and fast - she will lose more than her heart. 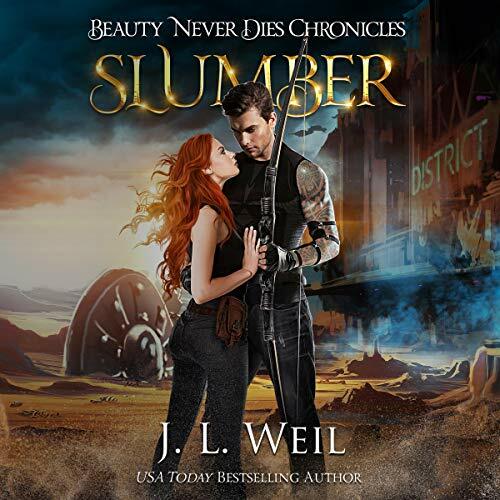 Fans of Hunger Games, The 100, and Divergent will fall in love with Slumber. I absolutely loved this YA paranormal fantasy audiobook! The story was well written and this new post apocalyptic world is totally different than anything I have previously read. I love teen/YA fantasy with a touch of romance and this story fits the bill perfectly for me! It took a few chapters for this book to capture my attention but once it did I could not put it down! There are a lot of things going on in this story. It is a fast paced story with danger at every corner but the characters are refreshing and funny. Their light banter makes it so enjoyable to listen to this outstanding audiobook! The story is told in dual POV which I always enjoy because you get an insight on both of the main characters. I’m usually not that interested in post apocalyptic stories but the description intrigued me so I decided to give it a shot. I’m so glad I did because this new world is fascinating and intriguing. There were a lot of unanswered questions that left me curious and wanting to see what happens next. There is a big cliffhanger at the conclusion but I absolutely loved this book! I’m definitely getting the next book in this great series! This book is an excellent start to a great YA/Teen fantasy series. I'm a grown up and I loved this YA dystopian fantasy romance adventure tale! The narrator was fabulous, I could actually feel the emotions of Charlotte as she explores the new world shes woken up to and her feelings for Dash. Charlotte wakes up in an exotic earth 100 years after the mist hit. Dash a rebel from the new governments army strike out on an adventure to find lost family members and defeat the army. A cross of X-men and Wizard of Oz, we aren't in Kansas anymore for sure! I am looking forward to the next book in the series for sure! Highly recommended. I received a free review copy of this book at my request and have voluntarily left this review. One of the best narrators of all time, in my opinion. Caitlin Kelly knows how to pull so much emotion and power from her reading. She is able to take this well-known story and make it original with the help of writer, J.L. Weil. Definitely get this audiobook, you won't regret it. This story is a play on the class Sleeping Beauty. I can't wait for the next one! I was given this book for free via Audiobook Boom in exchange of an honest review. Overall the book is enjoyable. It's a light and easy listen. The story is easily followed. I really enjoyed the world building, a chemical mist covered the earth changing the land and everything around it, including humans. No one knows the extent of the mist and its ever changing characteristics. Or who created it! Where I had a problem is with the main character. Typical rich kid stuck up girly teenager and love interest dark and mysterious hot guy. All the girls fawn over him but he only has eyes for the one girl he can't bring himself to actually commit to. I had my eyes rolling for most of the romance. intriguing story, middle school romance! I'm sad that it ended!! I really really enjoyed this book!! The story was so unique and imaginative. the character were well defined and the voice narration was fantastic. I kept watching the time as I came to the end. I didn't want it to be finished!!! I'm defiantly going to have time get my hands on the next book!! Charlotte and Dash's adventure so far was so exciting!! I can't wait to find it what awaits them. I received this audio book for free. I am leaving this review voluntarily. Kinda felt like it had great potential but let me down. I fell asleep to the book woke up and continued to listen and it was like I didn’t miss a thing ... just too slow moving for me and not enough action and romance maybe the next book will be better but I won’t be getting it any time soon. I received a complimentary copy of this audiobook in exchange for my honest review. Slumber is a book that both intrigued me and infuriated me and then left me needing the next book. It is set in a dystopian future, where a toxic mist has deformed and mutated the earth. Somehow, and I wish this was explained better, people were frozen in slumber for a hundred years, to wake up the same age as when it first happened. Yet, the world is in shambles and tech is gone, there was the tech to "freeze" everyone. I'm confused but intrigued. Our protag Charlotte (aka Freckles) awakens with a kiss to a world she was not expecting and is being sort-of rescued, sort-of brushed off by the guy that wakes her up, Dash. And here starts their we-can't-be-together-because-I-say-so romantic tension that comes and goes in waves through a few somewhat steamy scenes throughout the book. That's the infuriating part, Dash always seems to do something that is very Dash. The romance building between them pulls most of the plot along, as otherwise, this is a "journey" book where they are out there running and hiding from the Institute guards while trying to find their families, Charlotte having convinced Dash to help her in searching for her kid sister and parents. During their adventures, we find out the "gifts" Charlotte has gained from the mist. Her abilities are quite exciting and help them out of a pickle or two or three. Dash's ability is lethal and quite useful though he sure broods and is weighted down by all his guilt. I very much enjoyed the audio production. The narrator has a lovely voice that is so pleasant to listen to, and I've heard my share of voices. She has the perfect YA princess but I'm still a strong woman tone for Charlotte, and her voice for Dash worked for me as well. We had a few scenes completely from Dash's POV (one at the start, and one at the end) are narrated by someone else, and it would have been interesting to hear all the voices done this way, but this still worked well to differentiate the POV and character's internal voice. By "journey" I do mean the end is EPIC. All the bombs are dropped, all the feelings felt, and oh yea of course betrayals occur. The book ends with Charlotte and Dash in trouble and I have to know how they get out of this, and will they finally get together. So, next book, please? Slumber explores the post apocalyptic time following the exposure of human kind to an unknown mist. Dash Darhk is a young rebel of the new government in place following the "awakening: of individuals. Charlotte Winston is a former spoiled cheerleader brat, who cant think of anything other than the dimples on Dash's cheeks. The two find themselves partnered up following Dash's kiss to awaken Charlotte. They journey through new lands affected by the mist. They are attacked by new creatures as well as the Night Guard, the officers in the new governments security regime. Both are on a mission to find their families, with Charlotte able to remember nearly everything of her former life, and Dash unable to remember the majority of his life, including his real name. I enjoyed the story, though I was rolling my eyes and shaking my head at the actions and thoughts of Charlotte. I am hoping that she learns her lesson in the next installment of the series. The book was cut up into the two characters points of view, which made following along with their journey, both romantically and personally, easy. A fantastic, brilliantly written read that kept me hooked throughout the story. A great start to this fast-paced post apocalyptic novel! Wonderful characters. Loved listening to the story from both character's point of views. Great world building. A refreshing story. Excellent writing. So excited for more! The narrators were perfect for these characters - really enjoyable. I love this exciting future world. Following Charlotte and Dash throughout the exciting quest to find their families, dodging the Night Guard, and all the other hazards is so awesome. I loved the banter between the two as they traveled. The twists that this story takes and the revelations are so exciting. I loved every second of this story and I have to read the next book because the ending was killer. I loved listening to Gary and Caitlin narrate. They brought a story I already loved into a whole new world.